The quantity of flavouring used is a matter of personal choice but the following list given is for your guidance. Add cautiously for best results. Cakes up to 2 teaspoons per kilo. Milkshake up to 3 teaspoons per litre. Creams, fondants, icing and fudge up to 1 teaspoon per kilo. Ingredients: Propylene Glycol, Approved Flavouring, Water, Colour (E150). 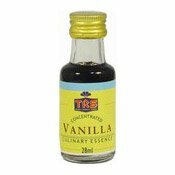 Simply enter your details below and we will send you an e-mail when “Concentrated Vanilla Culinary Essence (香草精)” is back in stock!